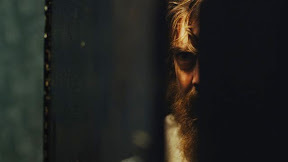 He may be working in the overcrowded genre of revenge but Jeremy Saulnier has us from the first frame of his remarkable Blue Ruin. It’s the little touches that make all the difference, which is evident early on given the film’s opening sequence and the way it establishes a tonal motif Kieslowski-style with the clever placement of blue objects that help foreshadow the mood of the story that's about to unfold. With a state of heightened realism, the emphasis on blue seems nearly accidental – so much that it might go unnoticed to the average eye but the cumulative effect reaches a fever pitch once we see the blue tarp over the car that our antihero will take on his journey of revenge. Likewise, the little touches are what make Ruin stay with you long after it's evolved from a simple tale of vengeance into something far more complex altogether. Namely, it's in a pitch perfect ending that the film comes full circle by harking back to a scene in the first act that most editors would’ve been tempted to leave on the cutting room floor since the action it covers is referenced in the dialogue (making it "repeated information" and as such, normally the first to get axed). 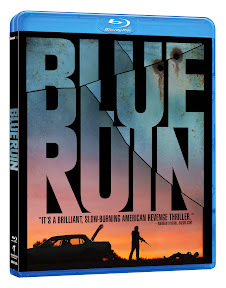 Yet because it comes back later, the effect is lyrical and heartbreaking in Saulnier’s taut, efficient work where not only is no shot wasted but Blue Ruin is that rare production that only grows stronger with each passing moment, regardless of the fact that he’s working in the revenge genre where thrills are expected. An economically executed yet organically intricate sophomore effort from the writer/director, upon its debut as part of 2013’s Cannes Film Festival Director’s Fortnight series, it received the FIPRESCI Prize that helped launch a word-of-mouth campaign that spread like wildfire up through its official 2014 release. 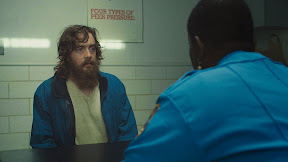 Now available to own on disc and demand one year after Cannes, Saulnier’s Ruin is as silent and driven as its nearly silent antiheroic lead (played by Macon Blair) who’s driven to avenge the murders of his parents upon learning that their killer copped a plea and will be released from prison early. As darkly violent as it is, Ruin is also surprisingly beautifully both due to the film’s naturalistic cinematography (such a priority given the filmmaker’s extensive background working in that field that he lensed Ruin himself) as well as its embrace of simple, straightforward storytelling. With the thematically similar, strong undercurrent running through the work which brings the truth behind the sins of the fathers that are inherited by his sons to the forefront, Ruin is reminiscent in heart, soul, blood and spirit to Shotgun Stories. 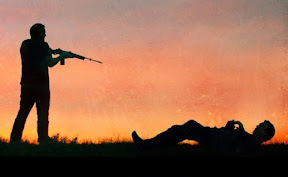 One of the most mesmerizing homespun revenge tales I’ve seen since Stories (which was the 2007 feature filmmaking debut of Jeff Nichols), I only hope that Saulnier will be as productive and prolific as Nichols in what I expect will be a promising future. 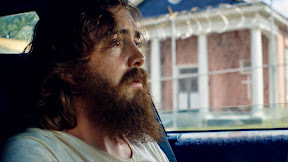 Although Blue Ruin is a distinctly American thriller that would make for a fitting selection to play in a festival program alongside not only Stories but also fellow bare-bones efforts including Sling Blade, Frozen River, and Winter’s Bone, Ruin would also be right at home in a double bill opposite Walter Salles’s underrated cautionary tale about generational grudges via 2001’s Brazilian period production Behind the Sun. Of course, there’s certainly no shortage of sagas surrounding the younger generation’s efforts to alter the sins of the past with more permanent measures in the present in what from a narrative standpoint owes a lot to literary tragedies whether Biblical, Greek or Shakespearean. Nonetheless, Ruin essentially plays best as a modern day western about a mostly silent man (who might as well have no name), setting out first on the offensive attack. It's only after the first body falls that he realizes there's no such thing as blood simple, since all two wrongs do is lead to a nasty ricochet that creates a new war with multiple targets as history repeats itself once again. Featuring a standout turn by Blair who must convey so much with a mere look or gesture, Saulnier allows us to go along with him in the passenger seat on what we fear will most likely be a one-way trip. Even more impressive for choosing not to drag out the moment of collision and inevitable confrontation, Saulnier holds the camera close as the messily brutal, frightening first kill goes down in the first act without fanfare, effect or musical applause. While most would’ve emphasized the event with a musical counterpoint or given his antihero a speech to read, the filmmaker knows there’s nothing uplifting about this moment and he opts to focus on the ugly grit versus glamorizing the action like a music video with slow motion cinematography, an operatic refrain, or John Woo's white doves. And by daring to play his hand so early on, we realize that Ruin has much more up its sleeve than a Charles Bronson-like Death Wish fight. Discovering one of many twists that follow, Saulnier turns Ruin into something that tests the very definition of revenge movie. On what becomes a personal quest, Blair comes face-to-face with the people from his past who’d all left him for dead, learning the hard way that you can’t go home again… even if you’re already there. With a terrific supporting role by Devin Ratray as a veteran who lives alone on land he protects with a rather large collection of guns, Ruin invites you to speculate on the dynamic and personalities of the two former friends – both whose “history of violence” has shaped into the outsiders they’ve now become. From the blue objects in the beginning of the film to scenes that build tension precisely because of what isn’t shown rather than what is, there’s much more to the people, pervading themes, and main plot-line that populate this successfully funded Kickstarter picture than what initially meets the eye. A modern day western tragic Noir with a bit of the Southern Gothic literary tradition tossed in despite the fact that it’s set in the Northeast, much like a dish of revenge best served cold (that has become as American as baseball, Fourth of July, and apple pie), this satisfying multilayered cinematic slice from Saulnier will definitely have you going back for seconds.